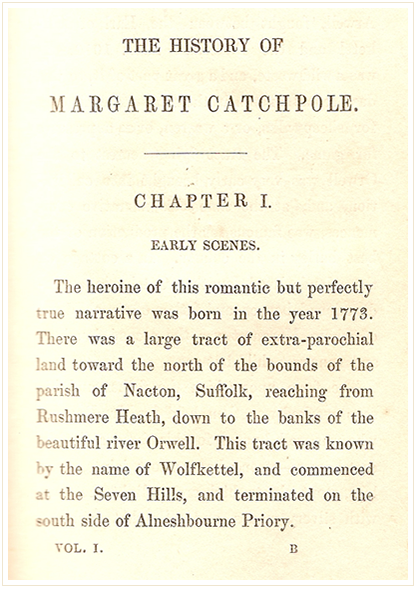 Our illustration shows the opening page of Volume 1 of The History of Margaret Catchpole, a Suffolk Girl in three volumes written by Richard Cobbold and published in 1845 by Henry Colburn of Great Marlborough Street, London. It rapidly became a best seller running to a further four editions in the next two years and has hardly been out of print ever since. As a result Margaret Catchpole has become a legendry figure not only in Suffolk where she was born but arguably even more so in Australia where her life ended. In no small measure her popularity stems from a simple error of judgement on the author’s part. Based on a true story, he wrote the book more than forty years after the events he describes. His embellishment of the facts in order to make a compelling story and thus communicate his moral purpose was questioned by many who remembered the much publicised case. There followed over 100 years of debate which sought to separate fact from fiction; a debate which remains unfinished. The Cobbold Family History Trust has a collection of material relevant to this debate and it will be the purpose of this part of the Trust’s website to expose this material to public view and to help resolve the issues which the book raises. Please visit from time to time to see the story unfold.